Amy and Tassie Cameron, Norman Jewison, Miranda de Pencier, Lynne St. David Jewison. 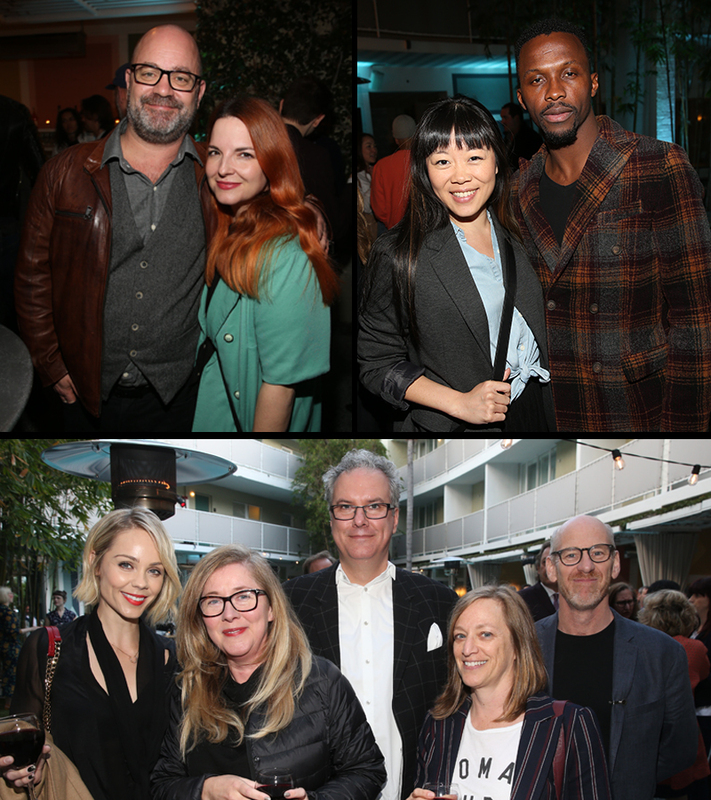 The sun and stars were out in full force at the Avalon Hotel Beverly Hills yesterday evening as we held our annual Los Angeles reception, celebrating our talented alumni working in Canada and abroad, as well as international partnerships. 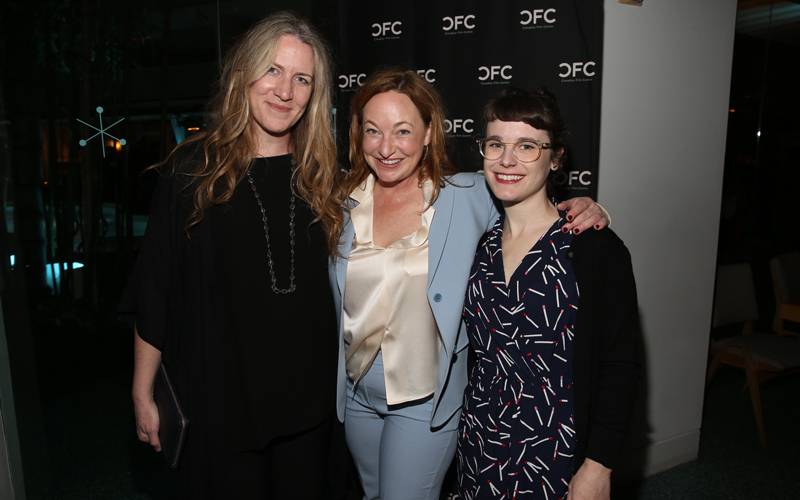 At the centre of this year’s event was the presentation of the 2019 CFC Award for Creative Excellence to talented and accomplished creators Amy and Tassie Cameron. Amy and Tassie Cameron, of Cameron Pictures. The Camerons follow in the footsteps of previous CFC Award for Creative Excellence recipients Semi Chellas, Graeme Manson and John Fawcett, Don McKellar, Damon D’Oliveira and Clement Virgo, and Christina Jennings. Sisters in life and work, Amy and Tassie founded Cameron Pictures in 2016. Together, they have produced such hit series as Mary Kills People and Little Dog. Amy began her career as an award-winning journalist, writing for New Brunswick’s Telegraph Journal and Maclean’s before becoming a production executive at CBC, where she would work on beloved series like Little Mosque on the Prairie, Heartland, Republic of Doyle and The Book of Negroes. Tassie, meanwhile, is a Gemini and Canadian Screen Award winner, with some of her most notable achievements including writing the films Cake (developed when she was in the Cineplex Film Program’s Writers’ Lab) and The Robber Bride; co-executive producing major Canadian shows such as Degrassi: The Next Generation and Flashpoint; and creating ABC’s Ten Days in the Valley and hit ABC/Global series Rookie Blue. In short, Tassie and Amy Cameron are a pitch perfect representation of creative excellence, their work spanning media and genres and earning accolades from audiences the world over. It’s no wonder they received such a warm reception last night, with a number of major industry icons coming out to express their admiration for them both. This year’s Master of Ceremonies, Roma Khanna, CFC board member and CEO, REVOLT Media and TV, began this year’s event, thanking presenting sponsor Netflix and co-host Cast & Crew Entertainment Services for their generous support of the event and the CFC overall. 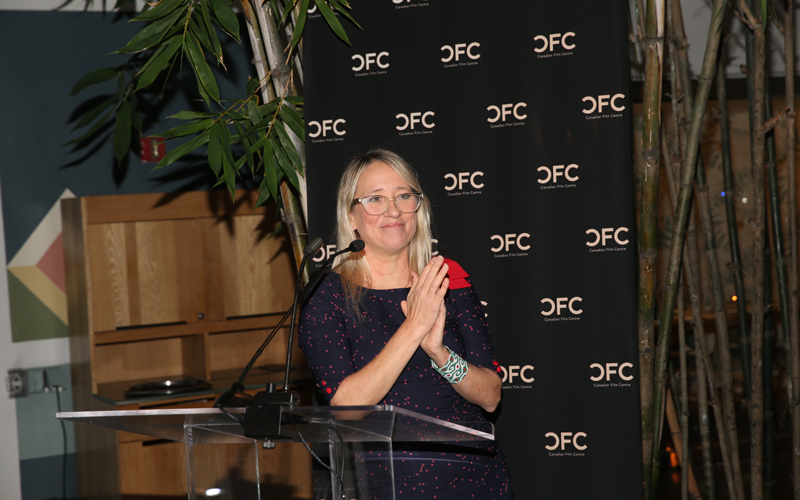 Slawko Klymkiw, CFC, CEO, took the stage next to share some recent CFC alumni success stories and introduce one such talented alumna, Miranda de Pencier (producer of CBC’s Anne with an E, and director of the soon-to-be-released feature film and festival fave, The Grizzlies). Miranda de Pencier introduces the Camerons. A longtime friend and collaborator of Amy and Tassie, de Pencier detailed some of their career highlights, sharing that they are not only excellent storytellers, but also notable supporters of original stories and the talent behind them. 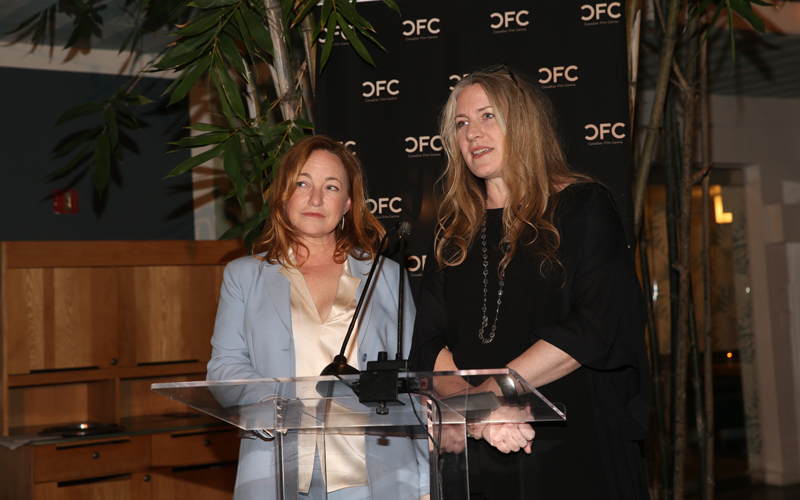 "The CFC has been a life-changing, career-altering place for us for almost 20 years. Our friends and collaborators from there have been a constant in our life and our work since then." Following de Pencier was Norman Jewison, legendary filmmaker and the CFC's founder and chair emeritus. After joking about the weather (the nearby thunderstorms were kept at bay), he welcomed the women of the hour to the podium. There, he and de Pencier presented them with original art pieces designed by Toronto-based graphic artist Riad in collaboration with fellow writer alumna, Sherry White (Maudie, Little Dog). Clockwise from top left: Graeme Manson and Adaline; Grace Lynn Kung and Emmanuel Kabongo; Laura Vandervoort, Daegan Fryklind, William Zmak, Pamela Davis, Larry Bambrick. 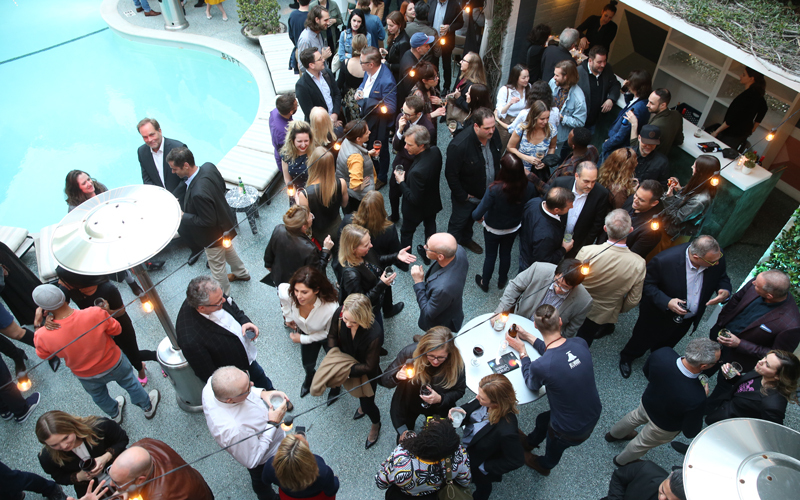 Following the speeches, guests mingled and enjoyed drinks and hors d’oeuvres by the Avalon Hotel’s poolside bar. Among the crowd were CFC board members Roma Khanna, Neal Clarance, Eric Belcher, David Zitzerman, Paul Bronfman, and, of course, Norman and Lynne St. David-Jewison. The 2018 Slaight Music residents (Timon Wientzek, Suad Bushnaq, Stephen Krecklo, Jason Couse and Ashley Jane), in town for the LA module of The Slaight Music Residency, were also in attendance. Thank you to all who attended last night’s reception and helped us make it a night of true celebration, an evening where old friends were brought back together and new partnerships were forged. We wish the Camerons the best as they continue to make and support new projects for the global marketplace. View more photos from the 2019 reception. All photos by Jesse Grant.